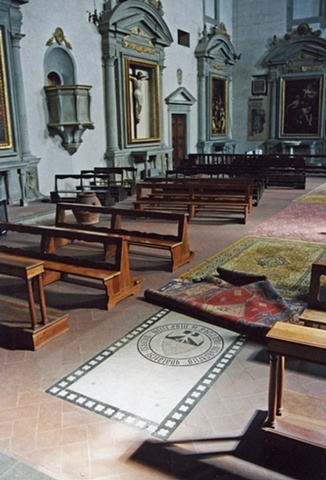 Inlaid stone panels and tombs found in churches are often covered with rugs for both practical utilitarian and protective purposes. In the church of San Niccolo in Florence, I was able to uncover, photograph, and make rubbings of a number of floor panels with the permission and kind assistance of one of the church's caretakers. Two paintings resulted from the imagery that I gathered from San Niccolo.